This delightful Russian fairy tale of the heroic Peter, the grumpy grandfather, the brave bird, the argumentative duck, the saucy cat and the “big grey wolf” provides wonderful character work for the young dancers and is a real coming of age piece for young audiences. Sergei Prokofiev was commissioned to write the work in 1936 to cultivate musical taste and appreciation of orchestral music in young children. The charming work, which introduces the instruments of the orchestra to the audience, was completed in just four days. Despite an inauspicious premiere season in May 1936 at the Central Children’s Theatre in Moscow, Peter and the Wolf has been thrilling young audiences for 79 years. 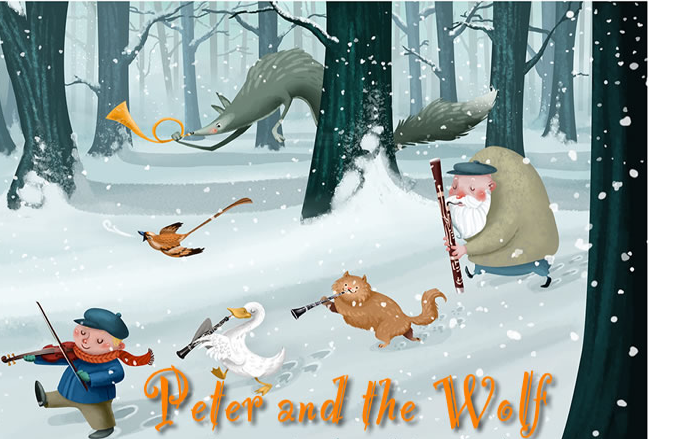 Composed in 1936, Prokofiev’s Peter and the Wolf is, as described by the composer, “a symphonic tale for children.” With ear-catching motifs for each character, it is pleasurable demonstration of how music can tell a story. Don’t miss the Tucson Premier of the Planets with able body DITSAZ dancers and special guest Madera, a wheelchair dancer.